Original purpose was to protect babies in cribs or beds, but EVERYONE needs to sleep and rest better! Especially important for beds with metal frames. 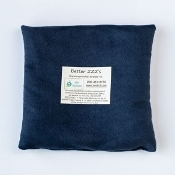 “Better ZZZ’s” and “Baby Better ZZZ’s” both work great on any bed/crib. Easy to take to hotel or travel on a plane. Copyright © 2010-2019 RestorMedicine. All rights reserved.